Jesus promised to send the Holy Spirit, the same person who enabled him through his ministry on earth. He will come as a helper (paraklētos, παράκλητος), or literally, one who will come along side to help believers. The Holy Spirit is a person, not an impersonal force. Just like the Father and the Son, the Holy Spirit is described with the masculine pronouns, “him” and “he”. Ephesians 4:30 shows the Holy Spirit possessing emotions and being grieved. The Holy Spirit is God. 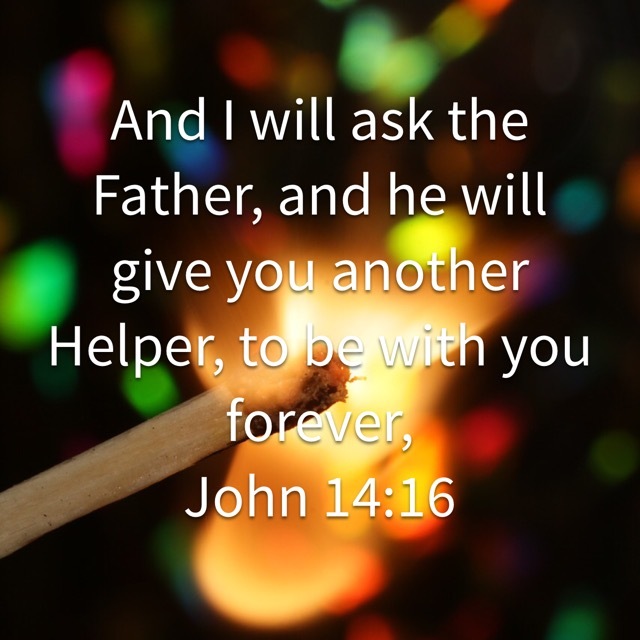 John 14:16 says that He will give another helper. The word for “another” here is allos (ἄλλος), which means “another of the exact same kind” . Jesus is not a different helper, but one who exactly like him. The Holy Spirit possesses the exact same attributes as God the Father and God the Son. Other scripture also shows that the Holy Spirit is God: Acts 5:3-4 (equates the Holy Spirit with God); 1 Corinthians 2:10-11 (he knows the mind of God); Matthew 28:19 (equated with the Father and the Son). The Holy Spirit will be with us forever. He was with believers in the Old Testament, but His presence was only temporary (see Psalm 51:11). Jesus promises that the Holy Spirit will never leave us. The Holy Spirit is the Spirit of Truth. He will lead us into truth (see John 16:13 below). The Holy Spirit is not visible to the world. The world is not capable of understanding the Holy Spirit. The disciples knew the Holy Spirit because He already was living with them in the person of Jesus Christ. He lived WITH them, but he would be IN them. Note the unity of the Father, the Son, and the Holy Spirit. The Father sends the Holy Spirit in the name of the Son. Jesus promised that the Holy Spirit will “teach you all things and bring to your remembrance all that I have sent to you”. Jesus was leaving and the disciples still had a lot to learn (John 16:12-13). His promise to them was that they would continue to be taught the Holy Spirit. How could Jesus leave the Gospel in the hands of 11 terrified followers? The Holy Spirit would teach them all they needed to know. Likewise, the Holy Spirit will teach us all that we need to know. There are two parts to this promise. The first part of the promise is to the eleven disciples. They will be writing the words of Jesus as they write pages of the New Testament. How did they remember the exact words of Jesus when they wrote them down many years later? The Holy Spirit brought his words back to their memory. But this promise is also for all who believe. The Holy Spirit will also teach us the truth from God and bring what he said to our memory. The context of John 15 is that the world will hate Jesus and all who follow him. But in the face of those who hate Him, the Holy Spirit will bear witness about Jesus through us. In contrast to the hatred and lies, He will be the Spirit of Truth. How does the Holy Spirit convict the world? He shows us our sin. Singular. There are many sins, but only one sin leaves you eternally separated from God — the sin of not believing in Him (John 3:18). He shows us our standard. Jesus is completely perfect. He has proved his righteousness by defeating death. He is now seated with God the Father. Jesus is the standard, and this is what he offers us if we believe in Him. He shows us our destiny if we do not believe. Satan is the ruler of this world and he is already judged. Jesus was leaving and they were not ready. The promise of Jesus was that the Holy Spirit would teach them. This promise is primarily for the eleven disciples in the room. They will be led by the Holy Spirit to write the scriptures of the New Testament. But he is also the teacher of every believer. He will reveal God’s truth to us. Note that the ministry of the Holy Spirit always points back to Jesus Christ. He will glorify the Son. John MacArthur, MacArthur Study Bible Notes, (c) 1997, Thomas Nelson, Inc. The New Open Bible, Study Edition, (c) 1990, Thomas Nelson, Inc.